In the last few years, reports of leafmining damage to daylily leaves have been received from several states. 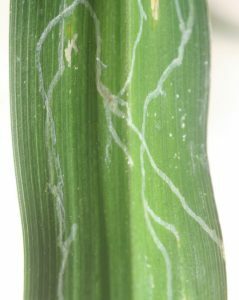 This damage appears as whitish meandering, serpentine trails caused by larvae feeding between the upper and lower surfaces of daylily leaves. Fig.1. 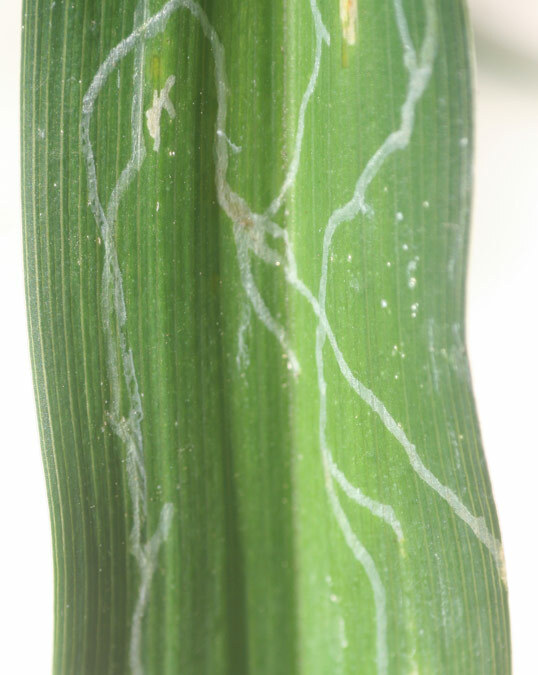 Daylily leafminer tunnels in leaf. Image courtesy of Linda Sue Barnes, used with permission. In 2011, specimens were reared and identified as Ophiomyia kwansonis Sasakawa, an agromyzid fly not previously known outside Japan and Taiwan. As of January, 2014, positive states are: AL, AK, CT, DE, FL, GA, IL, IN, KY, LA, ME, MD, MA, MS, MO, NH, NY, NC, OH, OK, PA, SC, TN, TX, VA, and WV. It has also been found in Europe, Slovenia. (see link below). 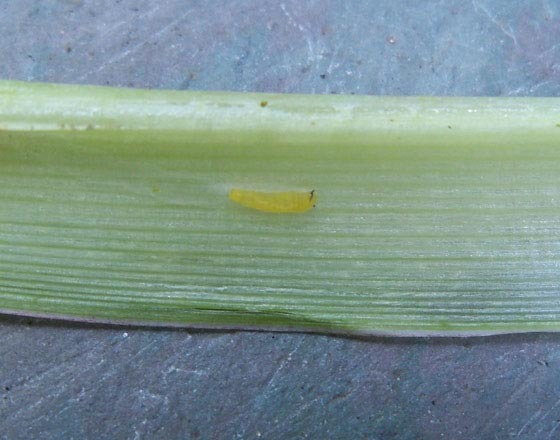 The small, pale yellow larvae (up to 5mm) travel up and down in leaf blades, leaving long mines which become progressively wider as the larvae grow. This damage remains until the leaf dies. Pupation occurs in the larval tunnel, with the pupa appearing like a small (3-4mm), tan rice grain, under the surface, often near the leaf base. Fig.2. 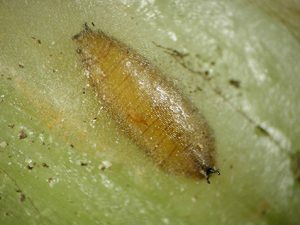 Large larva feeding inside daylily mine (mouthparts at right). Image by Robert Kann, used with permission. Fig.3. 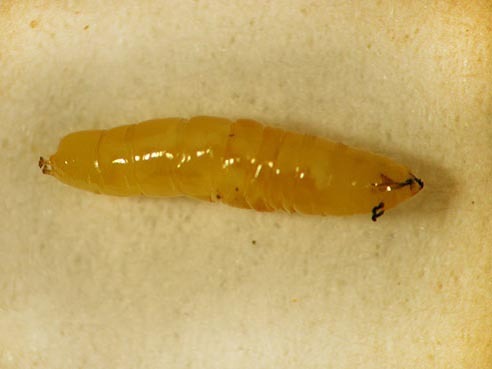 Large larva removed from mine (mouthparts and front spiracles at right). Image by Gaye Williams, used with permission. Fig 4. Leafminer puparium/pupa inside plant tissue (head end, front spiracles at lower right). Image by Gaye Williams, used with permission. 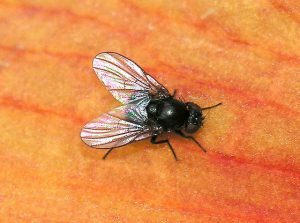 The adult fly (3-4mm) is small, black, and rather stocky with broad triangular clear wings. 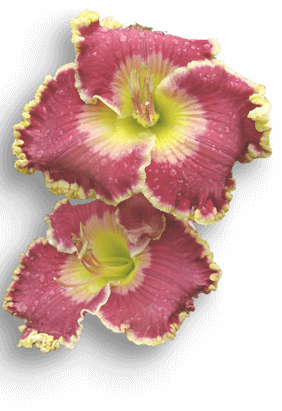 Adults may be seen walking up and down daylily leaves or resting on blooms. There may be one to several generations per season, depending on your growing region. The species might overwinter as pupae in crowns or dead leaves. No effective chemical control methods have been formally tested yet. Larvae and pupae would be unaffected by contact insecticides which would likely kill predators and tiny wasp species that have been found to attack this pest. Fig.5. 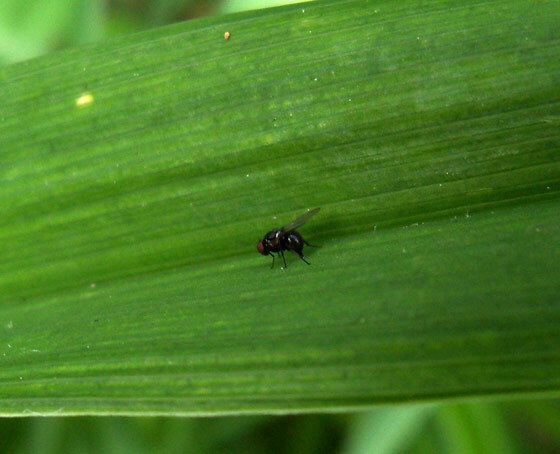 Adult leafminer fly on daylily petal. Image by Vincent Hickey, used with permission. Fig.6. 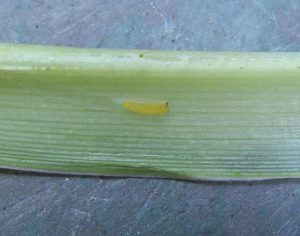 Adult female leafminer laying egg in daylily leaf. Image Robert Kann, used with permission. 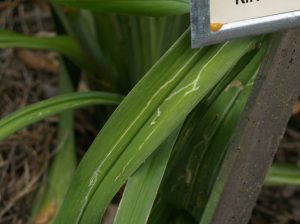 Gaye would also appreciate anyone seeing daylilies with leafmining damage contact her and send photos (not specimens), so she may track the spread of this pest. Md. Dept. Agr.-Pl. Prot. Sect. Image courtesy of Sandy Carlton, used with permission.